I have an admission to make. I didn't "get" that laundry pods were for high efficiency washers. I've been using the Kirkland Laundry pods in my standard top loading washer for months and have been very happy with them. Turns out others agree they're good.. Consumer reports just listed Kirkland laundry pods as a best buy in laundry detergent. Now let's talk pods, the latest thing in laundry detergent. Last year, Tide Pods were the only single-use detergent to earn our recommendation. 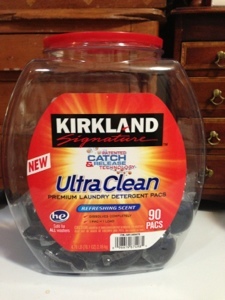 It's a pick again this year, but behind Costco's Kirkland Signature Ultra Clean Pacs, which perform slightly better while costing 8 cents less per load. A word of caution to consumers with young children: poison control centers continue to receive hundreds of calls each month concerning kids 5 years or younger ingesting the pods or spraying them into their eyes. It's imperative to keep pods out of children's reach, and call the poison-control help line immediately at 800-222-1222 if a child comes into contact with them. I'm not going to switch back to liquid unless I have to. The pods are just too convenient. Bought my first pack of these last week with the coupon. I like them a lot and they are convenient. I liked Costco's liquid brand of detergent also, both just as good if not better than tide and much cheaper.